MARIUPOL, Ukraine -- Ukrainian security forces in armored vehicles attacked a police station here on Friday, reducing the building to smoldering rubble and killing at least seven people, according to residents who say they witnessed the assault. The attack signaled what appeared to be a major escalation in the interim government’s fight with pro-Russian militants in eastern Ukraine, and came two days after President Vladimir V. Putin of Russia urged that the separatists delay a referendum scheduled for Sunday and that all sides settle their differences through dialogue. Hours after the assault, two bodies were still lying in the street, possibly victims of gunfire leveled by security forces against a crowd that broke away from a pro-Russian Victory Day march to lend support to mutinous police officers, residents said. 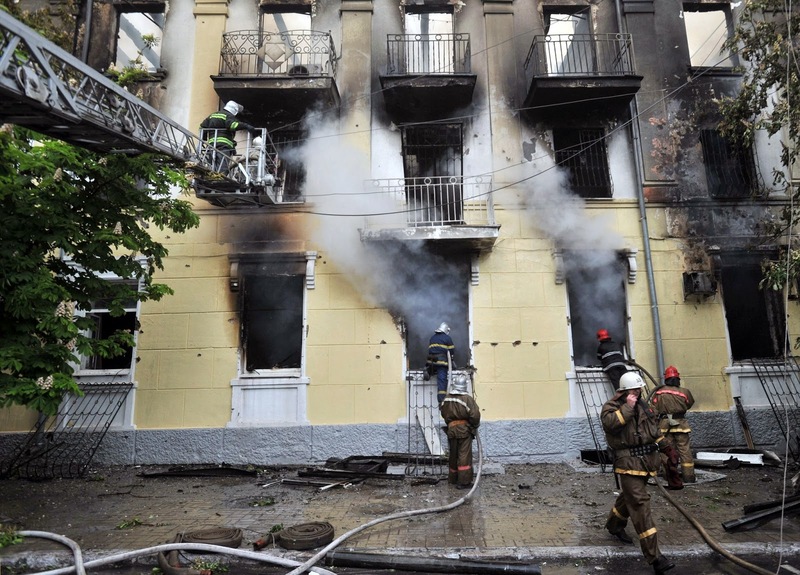 The death toll in Mariupol, a city of about 500,000, was expected to rise as rescue workers gained access to the police station, which exploded in flames. Hospital officials said they were treating 40 people for gunshot wounds and had sent five bodies to morgues, according to a Human Rights Watch researcher who had canvassed hospitals. The Kiev government said 20 rebels and one soldier had died. In recent weeks, Ukrainian Army units have taken up positions outside many of the cities in eastern Ukraine where pro-Russian militants have seized buildings and proclaimed an independent Donetsk People’s Republic. In that time, they attacked a few rebel-held checkpoints, but until Friday had not undertaken a frontal assault on any of the buildings held by the separatists. Ukraine’s interior minister, Arsen Avakov, wrote on Facebook that about 60 pro-Russian militants had tried to seize the city’s police headquarters. The police called for support from the Ukrainian national guard, a newly formed force of quickly trained volunteers drawn from participants in last winter’s street protests in the capital. Mr. Avakov wrote that 20 “terrorists” had died in the fighting, while those who survived dispersed and hid in a residential neighborhood. The national guard, though, pulled out of the city soon afterward, abandoning an armored personnel carrier that had apparently broken down and that was soon swarming with pro-Russian men trying to fix the engine. There were no police in sight. Residents who had gathered around the police station offered an account that differed from the interior minister’s. The city police, they said, were sympathetic to the pro-Russian side and had mutinied against an out-of-town chief newly installed by the interim government in Kiev. Armored vehicles had driven into the city to confront the rebellious police, not the militants, residents said. Holes in the brick wall suggested heavy weaponry. Anton Savchenko, 30, a factory mechanic, was in the group in the Victory Day parade marching toward a World War II monument, the Soldier Liberator, that then ran toward the police station after the fighting began. Rounding a corner, Mr. Savchenko said, a bullet grazed his ear. Hours later, he was still wandering about, dazed, showing the minor wound to anybody who cared to look. “I was born again today,” he said.